Perfect for office and industrial use! Place these vinyl shop ticket holders on any metal surface and keep job tickets at your fingertips. Perfect for office and industrial use! 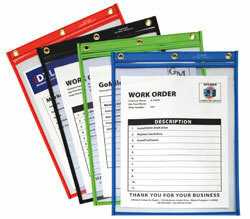 Place these vinyl shop ticket holders on any metal surface and keep job tickets at your fingertips. Sewn vinyl shop ticket holders feature magnetic backing. Perfect for attaching to machinery, file cabinets, racking and more. Strong, rigid, clear vinyl allows for easy visibility of documents. Convenient eyelet at top for hanging. Reinforced header and stitched edges for longer product life. Both sides clear. Holders open on short side. For inserts and papers 9 x 12 and smaller. 25/CT. Learn about the wide variety of shop ticket holders at C-Line..